Is it time for Varicose Vein Surgery or a Minimally Invasive Treatment? Compression hose, elevation, exercise, appropriate clothing and shoes, weight loss, and avoidance of heat are all excellent options to treat the swelling, throbbing, heaviness, and cramping of varicose veins. There comes a time when these therapies may no longer provide relief, or other complications arise such as weeping from the legs, skin ulcers or infections, and blood clots in the varicose veins. When that occurs, it may be time to consider alternative therapies. These alternative therapies are procedural, or surgical, performed by a vascular surgeon. Meet with the Surgeon. Call 305-676-8042 or click here to book a consultation at the Miami Vein Center. Sclerotherapy is a procedure that is performed in the clinic. This type of treatment uses a special type of medication, called a sclerosing agent, that causes scarring. A local acting numbing medication is placed around the area of the vein and the sclerosing agent is administered directly into the vein to allow the vein to scar. The scarring prevents blood flow in that vein and the blood flow must move through alternate veins in the legs. Sclerotherapy works best for smaller varicose veins or those found on the surface of the skin, called spider veins, and is less effective for large varicose veins. Endovascular laser therapy (EVLT) is another clinic based procedure that uses an endovascular laser that uses a type of light radiation. Much like sclerotherapy, only local anesthetics on the skin and surface tissue are used prior to an incision being made in the vein. A long tube-like structure, called a catheter to allow for the placement of the endovascular laser. The endovascular laser is then slowly moved through the vein allowing the radiation to scar the vein. This scarring causes the vein to close off, preventing any blood flow. Blood will flow through alternate veins to return to the heart. This procedure is better at treating large varicose veins than the sclerotherapy and usually only a single procedure is necessary. It is also a largely successful procedure, with about 90% of patients being successfully treated. The veins may shrink after EVLT, but those concerned with the cosmetic appearance of their legs may need other procedures. Surgical treatment is an invasive procedure that can also help varicose veins. This used to be the only type of procedure to treat varicose veins. The surgery requires general anesthesia, where the patient is asleep for the procedure. An incision is made into the varicose veins and special material is used to tie off the vein. For any of the varicose veins close to the surface, they are also removed, which is commonly referred to as vein stripping. 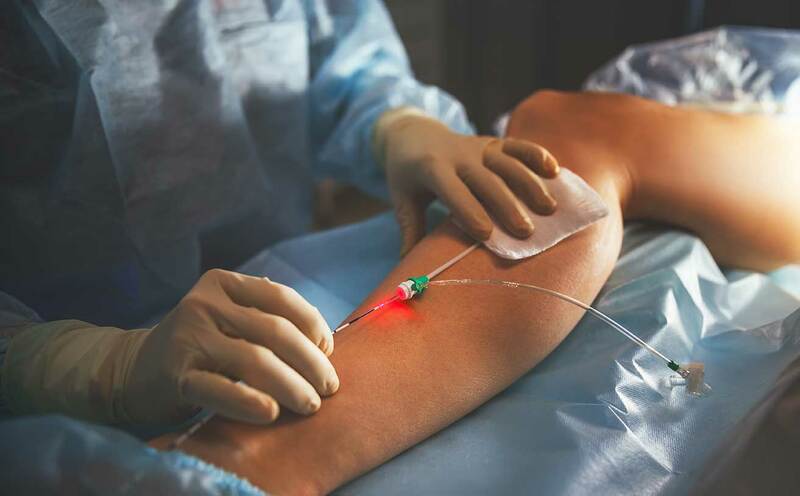 Surgery poses a higher risk for infection, pain, and there is a higher chance for the procedure to fail with recurrence of varicose veins within 5 years. Any of these procedures or combination of these procedures may be available to treat the symptoms of your varicose veins. Medical history, age, and current medication use are all important details in deciding which procedure may be best to treat your varicose veins. As with all of these surgical or procedural varicose veins procedures there are risks and complications associated with each procedure. Please visit your board certified doctor to explore your possible options for treatment of your varicose veins. Call 305-676-8042 or click here to book a consultation at the Miami Vein Center.